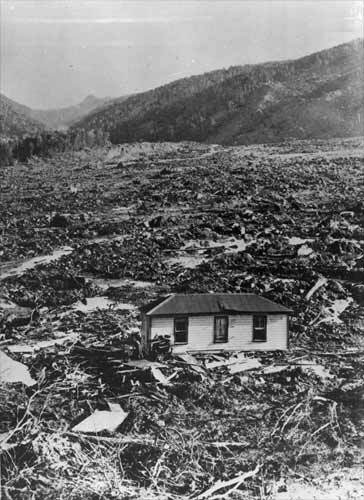 The upper storey was all that remained of the Morel homestead in the Mātakitaki valley, after it was overwhelmed by a landslide. Charles Morel and his wife ran ahead of the landslide – a moving slurry of water, clay, rocks and the wreckage of their house – but they tripped and fell. Charles Morel died, but his wife was found near the edge of the slip and rescued by a neighbour.